You can’t celebrate the awesomeness of concept art without paying special tribute to Star Wars. 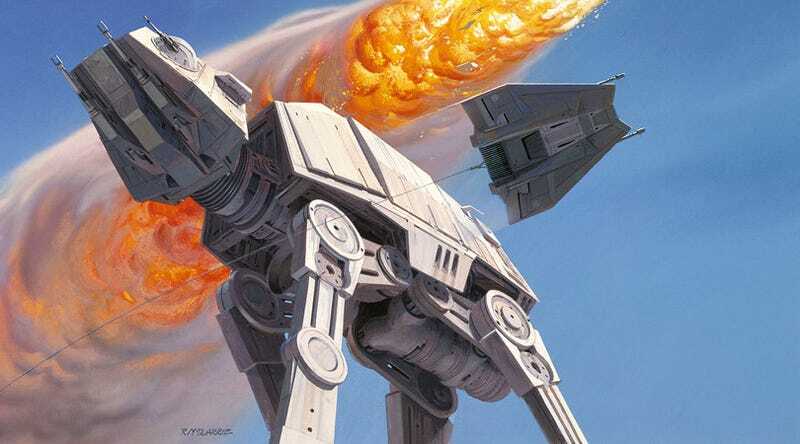 Ralph McQuarrie’s paintings for the original trilogy inspired every concept artist today, and the prequels and video games’ art was eye-popping. Here are our favorites. Almost every concept artist we’ve interviewed this week for io9’s concept art week has named Ralph McQuarrie as one of their main influences, and it’s easy to see why. From the earliest conceptions of the first Star Wars to the epic tableaux he created for Empire Strikes Back and Return Of The Jedi, McQuarrie brought an epic feeling to the series using the greatest special effect of them all: his imagination. Looking at some of the creature design from the original Star Wars, you can see how creatures like Yoda went through a lot of stages of development, before becoming the wise elf we all love today. Some of the early conceptions of Yoda look frankly a bit dorky, but it just makes you appreciate what we ended up with. A whole new generation of artists came to Star Wars for the prequel trilogy, imagining everything from a new kind of Sith to the creation of the Death Star. There are star cruisers, fighters, epic space battles, attack droids and clone troopers. A whole new kind of war among the stars came to life in the hands of artists like Ryan Church, Warren Fu, Iain McCaig and many, many others. Star Wars: The Force Unleashed and other video games have revitalized our love of Star Wars once again, making us see how much life and excitement remain in the galaxy far, far away. Force lightning, alien planets, Darth Vader’s secret sanctum - and most of all, tons and tons of epic battles, all come to life in the concept art for some of LucasArts’ recent video games. And here are a few cool bits of concept art from the recent Clone Wars series. All artwork is copyright Lucasfilm and the individual artists. Additional reporting by Mary Ratliff and Kelly Faircloth.